Armenian opposition leader Nikol Pashinyan asked his supporters to halt a general strike Wednesday after he said the country's ruling party assured him of its support in his bid to be prime minister. "The issue has practically been solved," he told protesters gathered in the capital of Yerevan. Earlier in the day, Pashinyan called on supporters to block streets, airports, the railway and other public transportation after he failed to get enough votes from the National Assembly to become prime minister. He was the only candidate running for the premiership and needed support from a majority of lawmakers to secure the replace former Prime Minister Serzh Sargsyan. The Republican-led legislative body initially indicated it would support him, but some blocked his bid Tuesday, saying he brought chaos to the streets. On Wednesday, the ruling Republican Party backtracked, saying it would support a candidate nominated by at least a third of lawmakers in the national assembly next week. The party said it would not submit its own candidate for the Tuesday vote. 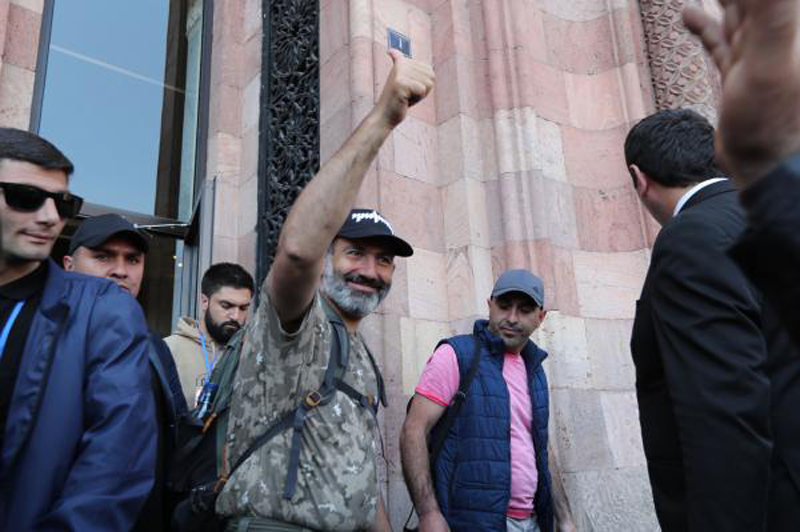 "All factions said they would support my candidacy... We are suspending protests and going to have a rest," Pashinyan said. Earlier in the day, tens of thousands of Armenians clogged Yerevan's streets and blocked roads and government buildings. Demonstrators marched through the streets, blowing horns and waving flags. Airport personnel, construction workers, medical staff and university students were among groups on strike and participating in protest marches. Parliament Speaker Ara Babloyan said demonstrators accosted some members of the assembly at their residences.